The application level is out of scope of this framework and is covered in internationalization (i18n) libraries, such as gettext . What is covered in Cubes is metadata and data level. To create localized report, just specify locale to the browser and create reports as if the model was not localized. See Localized Reporting. The metadata are used to display report labels or provide attribute descriptions. Localizable metadata are mostly label and description metadata attributes, such as dimension label or attribute description. 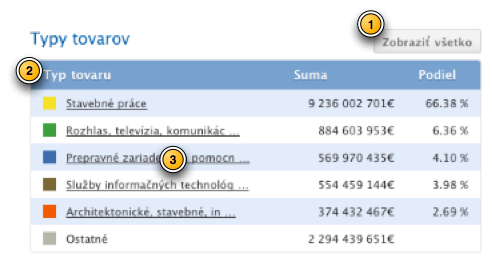 Say we have three locales: Slovak, English, Hungarian with Slovak being the main language. 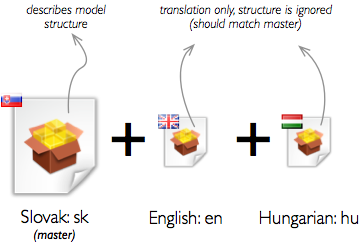 The master model is described using Slovak language and we have to provide two model translation specifications: one for English and another for Hungarian. The model translation file has the same structure as model definition file, but everything except localizable metadata attributes is ignored. That is, only label and description keys are considered in most cases. You can not change structure of mode in translation file. If structure does not match you will get warning or error, depending on structure change severity. If a translation of a metadata attribute is missing, then the one in master model description is used. Localization master model and translation files. Localization is assigned to a model namespace. If you have attributes that needs to be localized, specify the locales (languages) in the attribute definition in Explicit Mapping. Data localization is implemented only for Relational/SQL backend. Main point of localized reporting is: Create query once, reuse for any language. Provide translated model and desired locale to the aggregation browser and you are set. The browser takes care of appropriate value selection. Aggregating, drilling, getting list of facts - all methods return localized data based on locale provided to the browser. If you want to get multiple languages at the same time, you have to create one browser for each language you are reporting.